This home is 1 of 6, in this incredibly unique setting. Located behind the manicured grounds of the Wechbaugh Mansion. 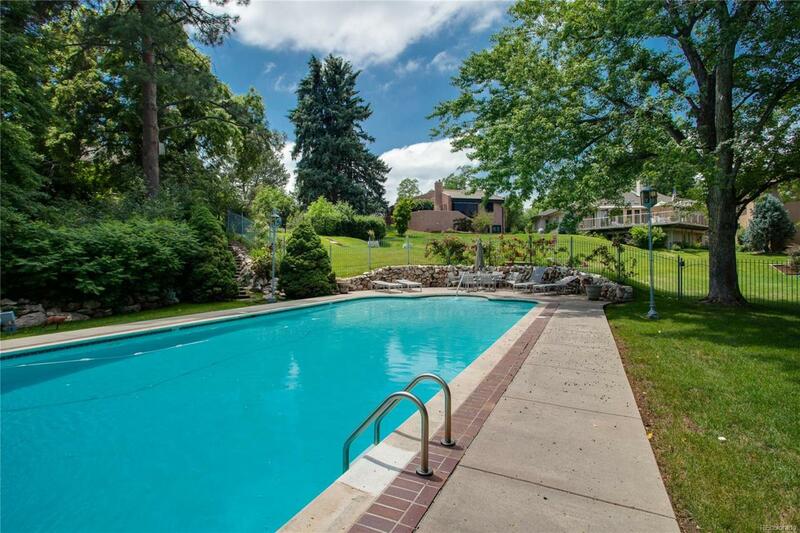 Just minutes to Cherry Creek and Downtown Denver, skyline views included! Enjoy soaring ceiling heights and art walls in the living room, through to a private Library/Card Room, complete with wet bar. The entry, and large, light filled Family Room/Kitchen, with striking herringbone wood floors and walls of French doors, sweep you out to a flagstone terrace, from which to enjoy a most stunning vista, across the gardens to the magnificent pool. Luxuriate in the large Master Suite which, along with the formal Dining Room, completes the sum of living areas on the main floor. Anything better than "his and hers master bathrooms and closets? The open staircase, or handy elevator from the updated kitchen, access the finished Garden Level. Combine the ample open space with Study/Workout/Media uses, 2 bedrooms, laundry, plus an oversized 2 car garage.